Recently I was browsing the dharma wheel forum in my quest to understand Dzogchen and came across some quotes that I found to be interesting commentary on the subject of meditation and enlightenment. “Oh what a pity!” was Jamgön Kongtrül’s response. The meditator thought to himself, “What is he saying! I wonder why; what does it mean? On the other hand, he is supposedly a great master. I will try it out and see what happens.” So he said, “All right, Rinpoche,” and left. When back in retreat, he had quite a hard time trying not to meditate. Every time he simply let be, without the attempt to meditate, he always found himself meditating again. To be discouraged because nothing extraordinary has happened since you began practicing is missing the point. Renunciation is the true sign of accomplishment, blessing and realization. In other words, there is a natural disenchantment with samsaric attainments, with any samsaric state. Unfortunately, people sometimes yearn for the extraordinary. Some expect the divine to come down from above and endow them with special powers. Others think that by forcing a certain experience forth in their minds to intoxicate themselves with, they can be high all the time, drugged on Dharma practice. Such types run around with their eyes turned heavenwards, not looking at the same level as normal people anymore, thinking they are tremendously special. Some people, when they get into an altered state of meditation, think that the very subtle forms of the three poisons which are known as the experiences of bliss, clarity and nonthought, are actually realization. Many people get stuck in their beliefs. When you start having clear dreams, the demons will take advantage of you. They will come and act as if they are messengers of buddhas, bodhisattvas and deities. They can lead you astray in all sorts of different ways. Do not attach any importance to these temporay experiences, not at all. There is only one thing to be confident in: the true state of realization that is unchanging like space. Understanding this is of utmost importance. Some people believe that they should just keep on meditating, and someday their egg will hatch and they will fly out of the shell and ascend to a completely different level. Actually, it’s not like that at all. We should not think, “The awakened state must be something really special. If I practice this long enough, one day a door will open and I will see it and all the qualities will pour into me.” It’s pointless to have this kind of attitude. If we really want something spectacular, we will indeed have opportunities for that, in what is called the ‘temporary meditation moods’ of bliss, clarity and nonthought. These can occur, but such sensational experiences do not help to cut through thoughts. On the contrary, they generate even more fixation because we start to think, “Wow! What is that? This must be it!”. Many subsequent thoughts arise in response to the fascination with these experiences. As I mentioned before, realization involves a process called recognizing, training and attaining stability. It’s similar to planting the seed of a flower. You plant it, water it and finally it grows up and blossoms. We are not like Garab Dorje, who, at the very instant of having mind nature pointed out, became a fully enlightened buddha without having undergone any training whatsoever. The moment of recognizing mind essence free from thought is like holding an authentic flower-seed in your hand and being certain of what it is. That itself is the self-existing wakefulness, the source of buddhahood. Enlightenment does not come from some other place. In my tradition, true Samadhi is not an outcome of concentration, settling or focusing the mind. True samadhi is the original, empty and ungrounded state that is the nature of our awareness. This is not a product, not a thing that is kept or sustained through the act of meditating; not at all. It is a recognition of basic awareness that is allowed to continue. We can have three kinds of thought activity. The first is called ‘surface thoughts’. It is the normal coarse thinking whereby we label different objects in our field of experience and become involved in an emotional response towards them. The second type of thinking is an ‘undercurrent of thought’. It is an ongoing mental commentary that we do not really notice. There is a third type of thought activity, a thought movement that we become involved in when we ‘meditate’. We sit and keep subject and object: there is ‘me,’ or that which notices, and the state of ‘samadhi,’ this sense of clarity and awareness. This creates the feeling, “Now, this is the state and it is ongoing!” It is not fully formulated or obvious. Very often, meditation practice is an exercise in keeping up that conceptual state. Afterwards, we think that the meditation state lasted for quite a while. What really lasted was the subtle notion of subject and object, appearing as clarity, as a brightness, or as maintained mindfulness. This is not the state of true samadhi that is totally free of home-made constructs or fabrications. The key phrase here is ‘originally empty and ungrounded,’ a state that does not require our making at all. Training assiduously with devotion, compassion and loving kindness while repeatedly letting be in unconstructed equanimity, you will surely discover the true signs of spiritual practice. 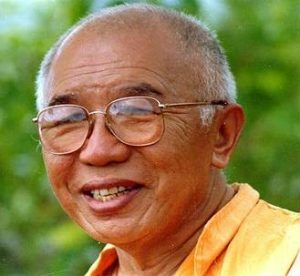 These signs are the acute feeling that life is impermanent and that there is no time to waste; that the Dharma is unfailing; that there is genuine benefit from training in samadhi; and that it is truly possible to overcome conceptual thinking. While these are taught to be the most wonderful signs of progress, a materialistic type of person will not see them as being so wonderful. Honestly, the view is not something spectacular; on the contrary, it is free from pinpointing anything particular at all…. Everyone is overcome by disturbing emotions unless they are stable in nondual awareness. Only the moment of the awakened state does not become caught up in deluded emotion. Nondual awareness is the most effective way, but the materialistic practitioner does not appreciate this. He wants an altered state, a special experience, an extraordinary dream. When it happens he congratulates himself, “Excellent! This is the real thing!” Such is the weakness of human nature. My root guru Samten Gyatso once said, “I have not had a single special experience. As the years pass by, my trust in the authenticity of the Dharma grows. I am confident in the truth of the three kayas. From the age of eight I looked into the essence of mind, and since then I have never forsaken it. My diligence varied and of course I became distracted at times, but mostly I have kept to the practice of mind essence.” I only heard him say this once; otherwise he would never discuss such personal matters. We have the preconceived idea or expectation that rigpa should be powerful, something much more extravagant, incredibly blissful, with clarity in all directions, totally free of thought, some sort of fantastic experience. While the awakened state of rigpa is plain and simple, lucid, present, and undisturbed, we refuse to acknowledge that it is actually rigpa, because it is not fascinating enough.